No, I don't know anyone in this pic. 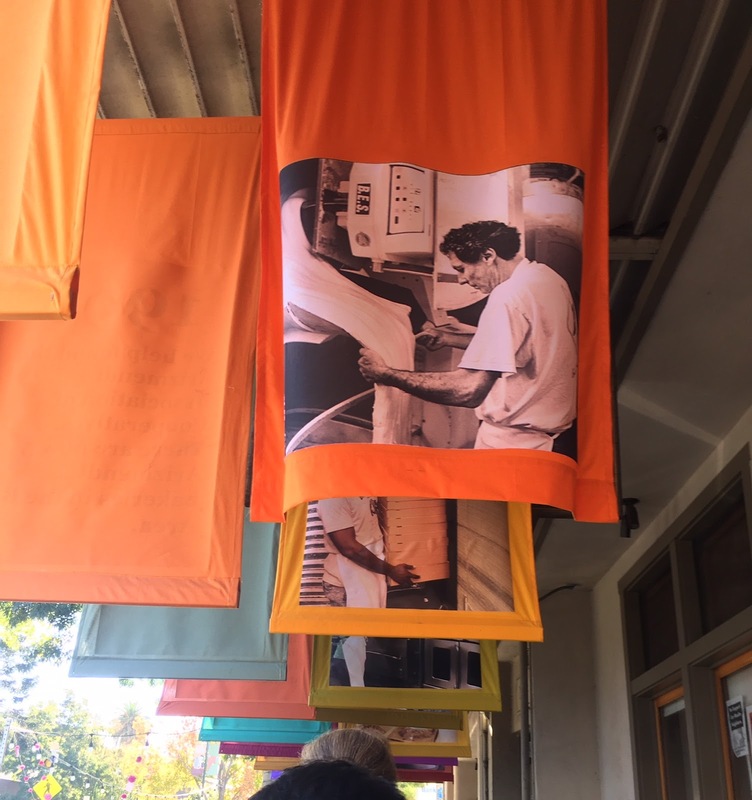 Interior/Exterior: If you're lucky, the live jazz band is playing, and you can enjoy while waiting in line and while eating your pizza afterward. 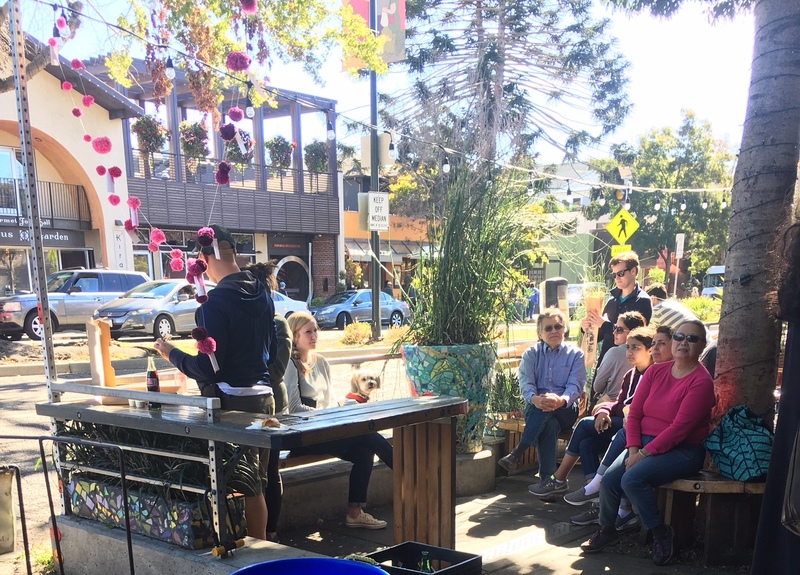 The indoor seating is limited, but there are a lot of tables that spread outside the building under the awning (where we sat below) and into the parklet on the other side of the sidewalk. There are also some more tables and benches outside of the Cheeseboard Cheese Shop, one store away from the pizzeria. You can also risk eating on the median, like us college kids used to do. The sidewalk is typically full of people standing in line for their pies, but the turnover rate for the tables is pretty quick, i.e. there aren't a lot of people standing around waiting for tables. The parklet area is really nice, decorated this month with pink pom poms, but also has mosaics and potted plants lining the borders. The vibes here are great. A lot of local families who seem to all know each other. Not too many students this Saturday (they are probably lazy and at Sliver , but it might have been a little more crowded than usual since it was a game day. Menu: I used to think a lot of the flavors were too weird for me, back before Andrew and I started dating and I was the pickiest eater on earth. 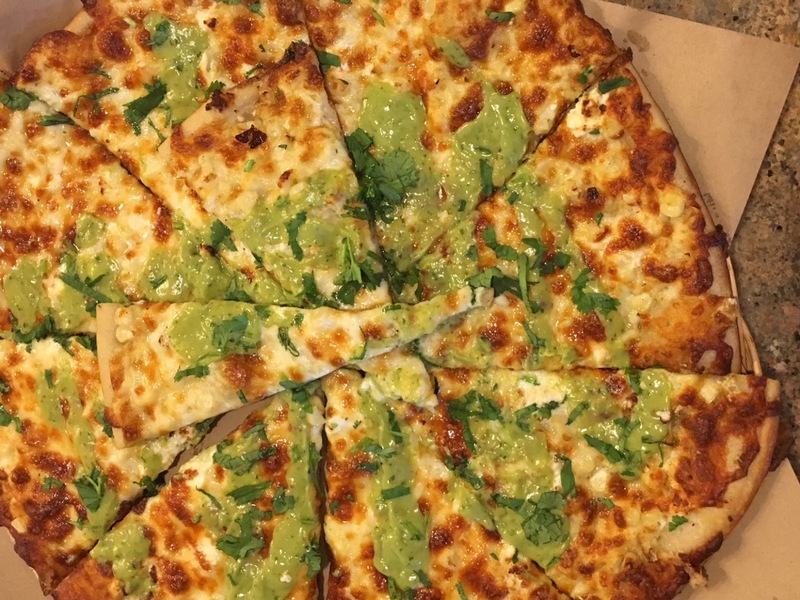 I didn't ever want to go to Cheeseboard unless I could easily pick off whatever they added to the pizza, so this avocado-cilantro pie wouldn't have made the cut. Back then, I only ate classic cheese pizzas. It's important to note that none of the pizzas have red sauce under the cheese. They make up for this with their pesto sauce, available in little cups or by the bottle at your table. Cheeseboard's flavors vary everyday and the week's lineup is typically posted at the beginning of every week so you can plan your visits ahead of time. My favorites are any pizza with corn, and of course the classic roasted tomato pies (the classic, considering the pizzas don't have red sauce). Pizza of the day: Pizzas with corn on them at both Sliver and Cheeseboard are my favorite. 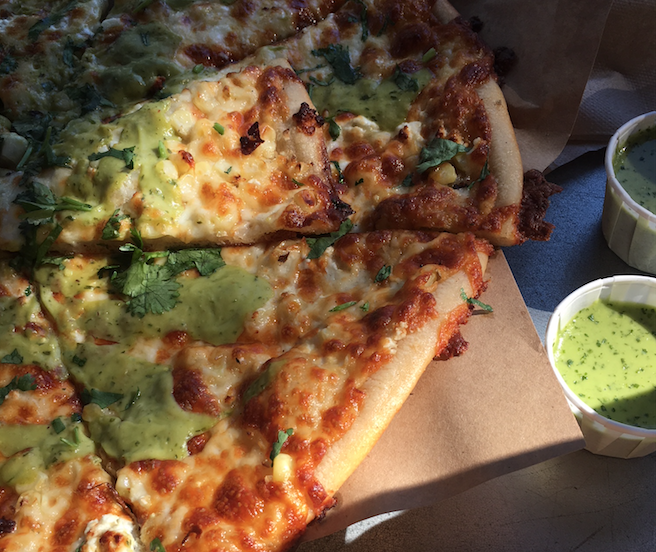 I hadn't had this avocado-cilantro sauce before, but it was pretty good. It was tart, but provided a nice contrast with the sweetness of the corn kernels. The cheese was excellent as usual. The crust is a lot crunchier than Sliver's, I think the dough is kneaded more thinly and even maybe cooked longer. It tastes almost pan-fried. The crust is also a lot smaller than Sliver's, more akin to the original crusts at Round Table... not that that's bad! 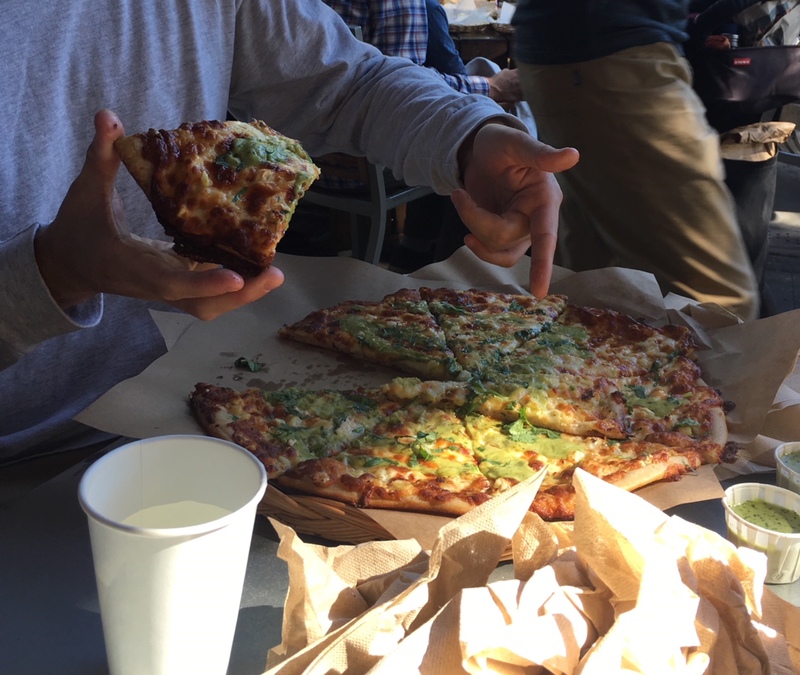 Instagram Opportunities: When we were in college, there was a lot more eating on the median across the street from Cheeseboard. People would just sit on the grass right underneath the sign that says "KEEP OFF MEDIAN." However, there must have been a crackdown on that because we didn't see anyone there. This might also be due to the additional seating added by the little parklet as shown above. 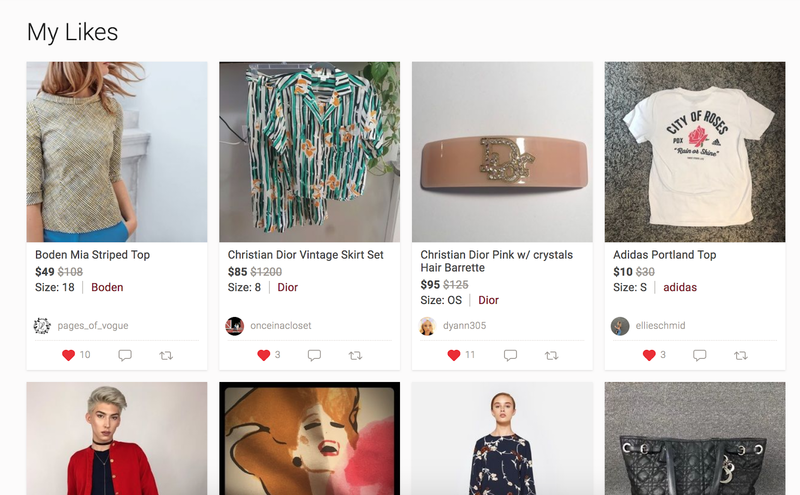 There are a lot of insta opportunities at Cheeseboard, especially considering it's a well-known and well-loved place by Bay Area folk. I personally didn't post anything, but Preethi posted the below pic. The decorated parklet would have also made for a nice backdrop. 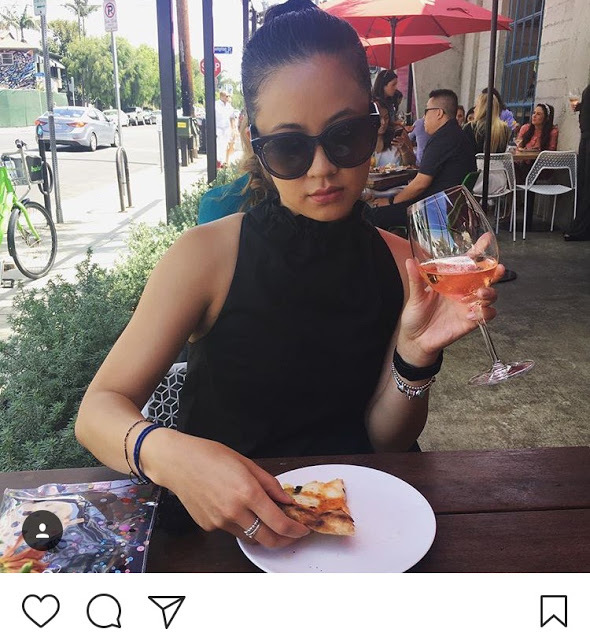 I also know that we have all posted old instas of us eating pizzas on the median (it's best when you show your rebellious side by including the "KEEP OFF MEDIAN" sign in the insta too). Even just a close up (including the little slivers) would be good. I like Sliver better because it's closer and I like their crust/dough better. However, they pretty much just ripped off Cheeseboard so the original place deserves credit where it's due. Plus they had a better flavor today and the vibes are better (families, dogs, decorated outdoor seating, live band). The only thing I don't really like is the part where you have to wait in line.